Accidental deletion happens a lot when we are using smartphone. It is really troublesome if we delete some very important contacts. It is a wise behavior that some iPhone users regularly back up the data including contacts to iCloud or iTunes. 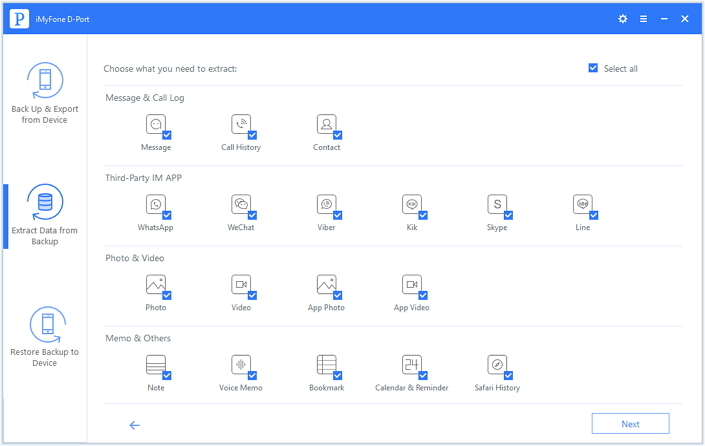 This article will explain three easy ways to extract contacts from iPhone backup if you have unfortunately lost any contact. Step 1: Go to icloud.com and enter your login details to access your account. 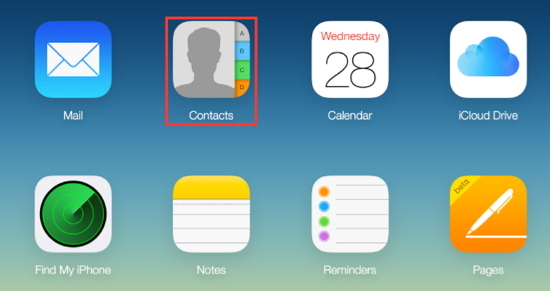 Step 2: From the main menu, go to "Contacts" and press it. Step 3: You will notice the "Settings" symbol, which is in the form of a clog. Press it and choose "Export vCard". Step 4: When prompted, save the file to your computer. Here is another way for you to extract contacts from iPhone backup. It is to use the third-party tool, which is an easier and more efficient way to do that job. The best tool we would like to introduce is iMyFone D-Port data extraction tool. It supports to extract 18 data categories. You can easily export text messages, photos, videos and other data files for your iOS devices or iTunes/iCloud backups. It works well with all iOS versions, including the latest iOS 11/11.1/11.2. It gives you the preview of all the extractable files for free. It is compatible with all iPhone, iPad, and iPod touch, iPhone 8/iPhone X are also included. Step 1: Download and install the program on your computer. Click "Extract Data from Backup" option from the main window. Choose one iTunes backup file you want to extract data from and press the "Next" button. Step 2: Choose the files type "Contact" that you need from the data types. Then click "Next"to scan the backup. Step 3: You will see the contacts from your iTunes backup file after the scanning. Mark the ones that you want and press "Export" button.The program will ask you to choose the folder where you want to store the files. 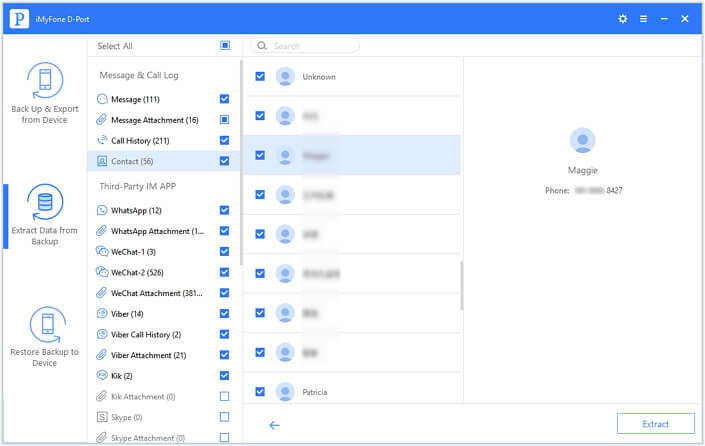 Once completed, you can browse the folder to check the extracted contacts file. You can also extract iPhone contacts from iCloud backups. The only difference is that you need to enter your iCloud account so that iMyFone D-Port can access to your iCloud backups. It is easy to reset and extract contacts from iTunes backup. Although it is possible to reset on the device itself, you will have to use the Mac or PC to restore directly if the device is unresponsive or stuck in the boot loop. Step 2: Connect your iPhone to the PC or Mac. Select the device within the iTunes. If you are unable to see the device, click on the "Show" button. Step 3: In the main screen, Click the "Summary" tab and press the "Restore" button. Step 4: A dialogue box opens asking you to back up the device. Take a backup if you do not want to restore the device to the factory settings. However, if you wish to restore it to the factory settings, click "Do Not Backup". Step 5: In the confirmation window, press the "Restore" to allow iTunes to begin the restoring process. If you wish to extract contacts from iPhone or from iPhone backup with ease, iMyFone D-Port data exporter will be a good helper. 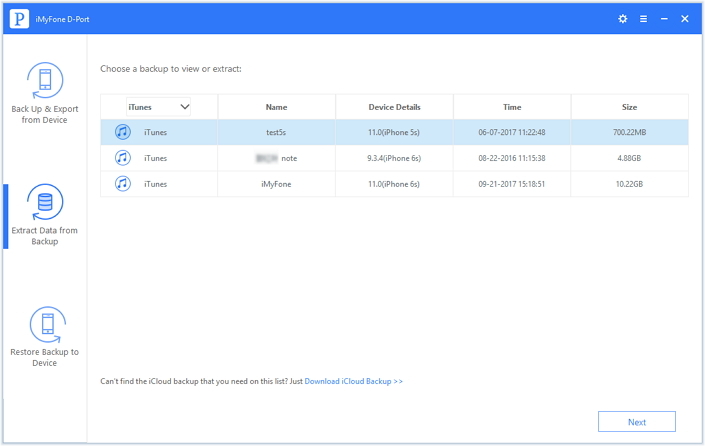 It allows you to extract the contacts or other files that you need or lose from iPhone backup in a few simple steps as explained above. The trial version is available for your free use. Don't hesitate to have a try! I searched more than 3 hours on google to find one best solution. And at least the article offers other useful methods besides their product. Anyway, I have downloaded your product.